The Core Swage Die (CSW-1) accepts a cast core or cut lead wire of slightly heavier weight than desired, and adjusts its diameter and weight precisely. Core Swage dies typically are used to prepare the core for insertion into a bullet jacket, although for high precision lead bullets a core swage may be used to pre-adjust the lead weight and shape into a cylinder prior to reshaping in a core seating die. These two steps can be combined in a LSWC-1 Lead Semi-Wadcutter die, which looks like a core swage die but forms the bullet base, nose, and final diameter instead of just preshaping the core. (For die ID markings, click Die Code). Also, a lead bullet with a smooth ogive curve can be made in a combined core swage/point forming die called the PF-1-SB or PF-1-HB. 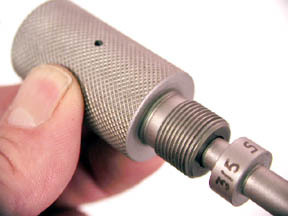 This is a point forming die with bleed holes and a synchronized pressure sealing ejection, often used to make high precision airgun pellets and muzzle loading slugs. 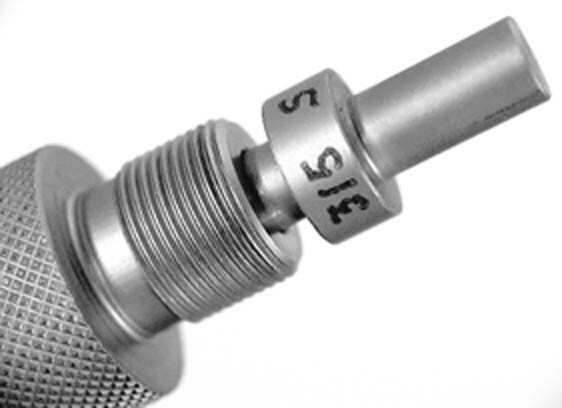 But for swaging jacketed bullets the CSW-1 core swage is universally employed as the first step. Every set of dies normally includes the Core Swage Die, as the first die. You can choose not to purchase a core swage die, if you wish. The advantage of the core swage is that you can adjust the weight of the lead slug or core that you have previously cast or cut from a roll of wire, and make it far more precise. The core swage die extrudes a small amount of lead through tiny bleed holes, so that the core becomes the exact weight you want. The core also is formed with clean, flat ends and a cylinder shape, to fit neatly into a bullet jacket (or the next die, for lead bullets). The flat ends help guide hollow point punches straight, in the following stages. Cutting a wire core leaves a shear angle on the end, which can drive a pointed punch off center. Without a core swage die, you may need to first press the end of the core flat with a flat punch, in the next die, before using certain other shapes of punches. Core swage dies, like all swages, need to have a larger diameter hole than the lead you intend to put into it. Never force a larger piece of lead into a smaller die! It doesn't work. The diameter of the core swage will depend on the next step. If you are making a jacketed bullet, the core will need to fit easily into the jacket. The jacket may have thick or thin walls, so the core will probably need to be smaller for a thick-walled tubing jacket than a thin-walled commercial jacket. If you are making a lead bullet using two or more dies in sequence, the lead core can be much larger than it would be for the same caliber of jacketed bullet. For more info, click Core Size. The only way a core swage die can give you consistent precise weights is if you allow the ram of your press to reach the same exact position for each core made. If the ram is raised part way one time, and all the way another, then the volume left in the die, between the top and bottom (external and internal) punches will vary on every stroke, leaving various volumes of lead in the die. The goal is to always leave the same volume between the punch ends, so all the surplus lead is extruded out the bleed holes, leaving a precise length of core in the die. To insure constant weight, always make sure the core is 3-5 grains heavier than you need, before it is swaged. Then bleed off this surplus amount to make sure none of the cores come out lighter. Any core that does not bleed of some amount of lead, then, will be too light and can be instantly detected by the lack of resistance on the press. The ram must stop at the same point. The best accurate stopping point is the physical end of the stroke, because the press cannot possibly go any further than this. If you set up the punch holder position, in the press top, so that you do all your core swaging as the press reaches the top limit of its travel, then the cores cannot help but come out the same length, and thus the same weight and volume. As a further refinement, you can carefully control the length time that the press remains at the top of the stroke. Lead flows continually under pressure, so it will tend to "creep" under low pressure. If you jerk the ram rapidly up and down, your cores will vary because you interrupt the flow while it is at the greatest point (but not precisely there). If you press, hold a few milliseconds, then lower the ram, the cores will be more consistent in weight because the lead has had some time to slow down its flow before being interrupted. The core swage die is also a percentage of difference device: it continually improves the weight control percentage as you re-swage the same core, because the core starts from a more consistent point and the slight bleed off that results is a more consistent amount as a result of the more consistently developed pressure. Thus, if you are extremely paranoid about weight variation, swage all your cores twice or three times, taking off 3-5 grains the first time, then 0.4 to 0.6 grains the second time, and finally less than 0.1 grains the last time. Does this amount of work translate to that much tighter groups? Probably not...weight control is far more important to handloaders than it is to the bullet trajectory or group size. A weight variation of 5 percent (of total bullet weight) would cause enough variation in trajectory and burn rate to be a minor problem to a benchrest shooter and hardly any problem to a high power match shooter or game hunter. A variation of 1 percent (of total bullet weight) would be about as good as anyone would every need in practical terms, world class accuracy being possible if all else is in that class. A variation of 1/2-percent of total weight is beyond the stated accuracy of most scales and other instruments in any case, and is so precise that it no longer matters. Anything better is an exercise in the old syndrome that says "If your only tool is a hammer, every problem looks like a nail". This tendancy to make every problem a weight problem is because the one tool nearly every handloader has, which is capable of 1% or maybe even 1/2% of full scale accuracy precision, is a powder scale. Certainly if the weight variation is caused by an eccentric jacket or air bubble in the core, then the bullet will not be balanced as well as it could be, and a small variation in weight from this cause would result in bigger groups. But if the same variation in weight is concentric, and only caused by more or less core length, then the effect on group size is negligable in ranges of variation of less than 1 percent of the bullet weight. Certainly not! Does 10 grains on a cruise missile make any difference? So how do we decide how many grains variation is important? A good rule of thumb is that a concentric variation (meaning, it comes from more or less material in length, rather than inclusions or other off-center variations in the material) of 2% or better is fine for hunting, 1% or better is excellent for most target shooting, and 1/2% world class benchrest level. The core diameter from the core swage die must fit into the jacket you plan to use. And the lead wire, or core mould, needs to make a slug with a diameter that goes easily into the core swage die. Therefore, if you know or can measure the inside diameter at the bottom of the jacket, you know the proper diameter of swaged core. If you know the wall thickness of the jacket, you can double this and subtract it from the outside diameter to obtain the inside diameter. Corbin determines the correct diameter for your core swage if we know the jacket you plan to use or can get a sample from you (or, of course, if we supply the jacket). The core will come out almost the same diameter as the bore of the die, because lead is a "dead" material that does not exhibit much springback. But it is soft enough so that you need to be able to slip it easily into the die by hand, and not try to force it in with the punch. Otherwise it will expand and fail to enter fully, shearing off some of the material as you force the punch through the mushroom button that is produced. A good rule of thumb is that the core wire (if you choose to use lead wire) or the core mould (if you choose to cast scrap lead into cores) should make a cylinder of lead that is at least .005 inches smaller than the I.D. of the core swage die. It can be considerably smaller than this, but if it becomes too small in diameter compared to the die bore, then it will have to be too long for its weight. You can tell if the core is too small because the proper weight will be so long that it buckles or folds and cannot fit easily into the die without moving the punch up and down. The core should be entirely inside the die before any pressure is felt on the press handle. If you must start compressing the lead before it is entirely in the die, then it will probably fold, mushroom, and fail to go in. For example, a .308 jacket with a .028 inch thick wall (at the base) would have an inside diameter of .308 - (.028 X 2) = .252 inches. Therefore, the swaged core should not be any larger than .252 for this jacket. If you used a thinner walled jacket, you might be able to use a .258 or even larger core. And if you used a copper tubing jacket with a .035-inch wall, you might not be able to use any core larger than .308 -(.035 X 2) = .238 inches. Obviously, the same core swage may not work for all jackets in a given caliber. It is important to make sure the core swage die, and the selected jacket, are compatible. If you plan to use both thin and thick jackets, then select the smaller core swage because it will work with both in nearly all cases. In fact, a core swage may even work with more than one caliber! A .224 and a .243 jacket may have nearly the same I.D. near the base, even though the .243 jacket is larger in O.D., if the .243 is made from thicker base material. And even if the two calibers have different minimum inside diameters, a .190-inch core will usually fit a commercial drawn .224 and still work rather well in a commercial .243 jacket. In fact, even a .257 jacket can be used with the same .190-inch diameter core (though a .204 or larger core might be a little closer fit, it doesn't make enough difference to matter). However, the same core swage that might work with thin wall .224, .243, and .257 jackets probably would require too long a core to work with a typical weight of 6.5, .270, or 7mm. You can see that core swage dies are not tightly locked to a given caliber for their diameter, but can span a narrow range. Also, core swage dies are more closely related to the jacket inside diameter than they are to the specific caliber...sometimes a thick walled .458 jacket will use the same core swage diameter as a thin walled .375. Fortunately, you don't have to know the diameter in order to procure the right die, as long as the die-maker has your jacket sample to use. Corbin will make sure that your core swage die is appropriate to the jacket and to the final bullet it makes. 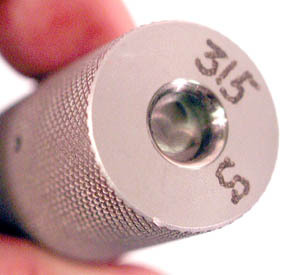 The external punch is marked with "S" to indicate that it fits a core swage die. The diameter of the die is also marked on the punch, rather than the caliber (because one diameter of core swage might be used with several calibers). 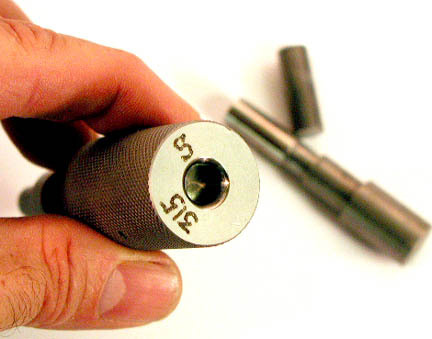 The core swage internal punch is also marked with "S" and with the diameter of the die bore (which is the same as the core diameter produced by this die). Note that core swage dies have bleed holes in their side to allow adjutment of the weight, and the internal punch must not cover these holes when the ram is raised. Core swage internal punches have a head that controls the protrusion of the punch into the die, which sets the volume that can be put into the die, and thus the maximum weight. A punch with a thinner head can make a heavier core, while a punch with a longer (thicker) punch head holds the core closer to the die mouth and makes a range of lighter cores. If a given set won't make a heavy enough or light enough core, then a new internal punch may solve the problem. 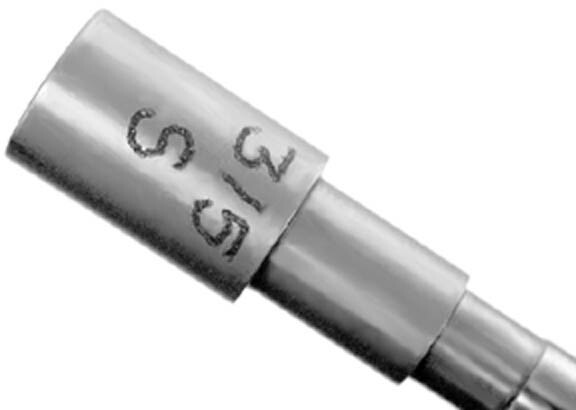 The core swage die has an "S" and the diameter marked on its mouth. The illustration is of a type -S die (which fits the S-press, discontinued Hydro-Mite, and earlier Series II Corbin press). There are also type -R (for reloading press), type -M (for older Corbin and SAS presses), and type -H (for Corbin Mega-Mite, the discontinued Hydro Junior, and Hydro-Press systems).